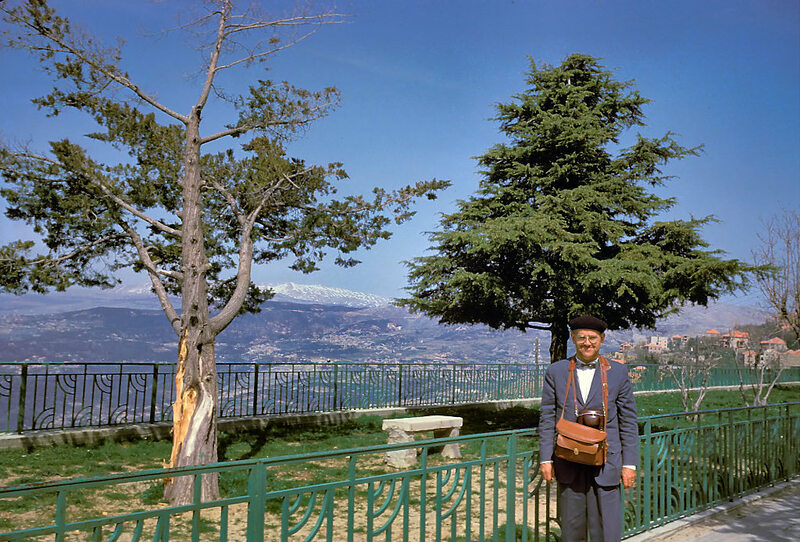 Dr. Charles Lee Feinberg, Dean Emeritus, Professor Emeritus of Semitics and Old Testament, Talbot Theological Seminary, made eight trips to the Holy Lands between 1959 and 1968. He took thousands of photographs of biblical sites and objects, and the best of these have now been digitized for easy use. Besides the tremendous knowledge of the subject that Dr. Feinberg brought with him on his travels, his photographs captured sites and scenes now unavailable because of increased population, construction, and wars. 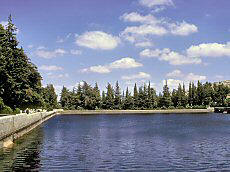 This volume includes nearly 400 photographs in PowerPoint and high-resolution (1600x1200 or higher) jpg format. 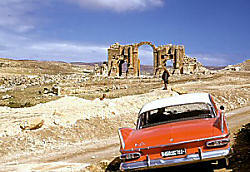 Photographs are included from Dr. Feinberg’s travels in Israel, the West Bank, Jordan, Egypt, Syria, Lebanon, Turkey, Greece and Rome. "The story of Dr. Charles L. Feinberg is an amazing chronicle of God's grace. From his birth into an Orthodox Jewish home to his dream of becoming a Rabbi, to his wonderful recognition of the Lord Jesus Christ as His Messiah, to the founding Dean of Talbot School of Theology at Biola University, his life was a remarkable journey. I had Dr. Feinberg as a professor in my theological studies and was absolutely amazed at his knowledge of the Scripture and the practical application of it. Here was this giant of a scholar who showed such love for his students, and my life was changed because of his ministry. 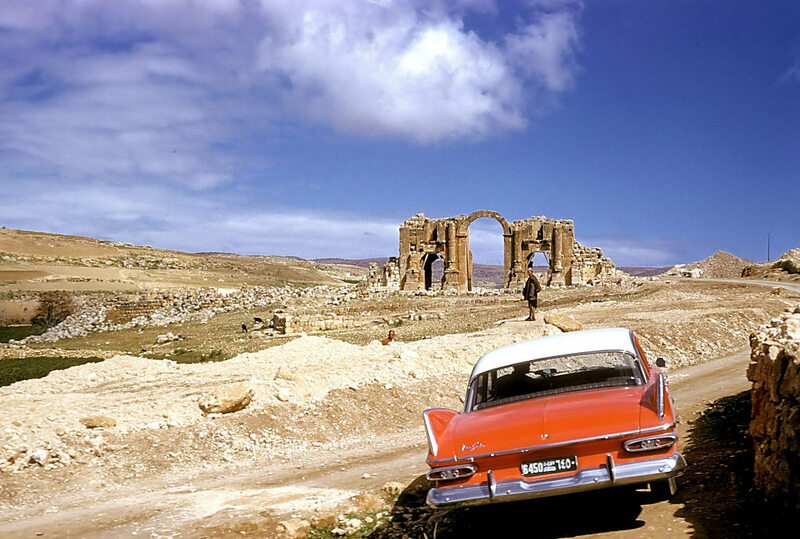 Besides his writings and his sermons, we now have available to us pictures that he took in the 1960s during his travels to Israel. So much of Israel has changed in these past 40 years and this CD allows us to view the state of Israel and the birthplace of Christ during this important time in Israel's history." "Here is a treasure indeed. These are pictures from a man who loved God; loved God's promises; loved God's land; loved God's Word. Dr. Charles Lee Feinberg adds to his already rich heritage with these pictures, which cannot be duplicated today. Many of these teaching slides are no longer available—some sites are destroyed; for others, the configuration of the landscape has completely changed; over others, structures have been built obscuring the view. Dr. Feinberg was a godly man of unmatched genius. How wonderful to have his pictures now available in digital format." This is an historic find for all those who are interested in the modern history of Israel. Here is the personal library of photographs taken by Dr. Charles L. Feinberg, the leading Jewish-Christian scholar of his day and a great lover of the land of the Bible. These photographs provide a rich, historical treasure for all who are interested in the unfolding saga of God’s chosen people. I had the privilege of being a former student of Dr. Feinberg’s who considered him both a teacher and mentor. I am grateful for the availability of this resource. 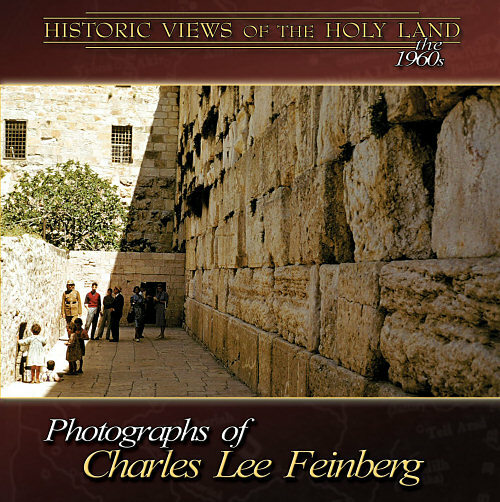 "The viewer of these photographs has the rare privilege of viewing the lands of the Bible through the eyes of one of the most prominent Biblical scholars of the last century, Dr. Charles Feinberg. 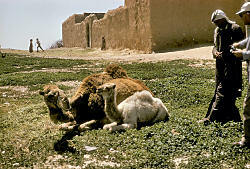 Though taken in the ’60s, these pictures exhibit the breadth of the Bible lands rarely seen in one collection of that time. But these are not just pictures of historical relics. The modern traveler will be aware that some things have changed since these photographs were taken. But the message behind them lives on. 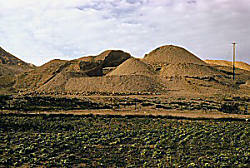 This is God’s land, promised to the descendents of Moses forever, Genesis 13:15. For those who have a love for the nation of Israel, each picture will seem like a vital part of a family photo album. They exhibit a rare combination of history and prophecy, leading to the inevitable conclusion that God is not finished with His people yet!" "In this visually charged, image saturated culture, the Photographs of Charles Lee Feinberg will enable you to see the land of the Bible in its historic context. Sometimes sad because of war's effects, sometimes joyous in expectation of the Lord's coming, you will experience the Holy Land through the eyes of one who loved it and “prayed for the peace of Jerusalem." 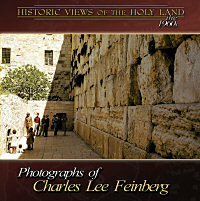 "As a young pastor, I have found Dr. Feinberg’s Photographs of the Holy Land to be a valuable ministry asset. It is critical to bring the Land of Israel to life for our people, because so much of the Bible’s context is set in the Land. Dr. Feinberg’s photos are a powerful teaching aid to bridge the visual gap in people’s understanding of the Land of the Bible…and the Bible itself!" From the Producer's Introduction: "This collection does something more than a tour guide can do today: looking at these pictures you are taken through a window in time, back to the decade of the 1960s . . . . Most will be intrigued with other differences from the 1960s. 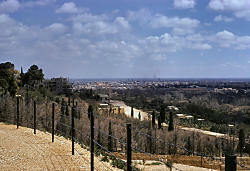 The City of David today is covered by houses, Jewish and Arab, and the ability to see the ground itself is impossible. 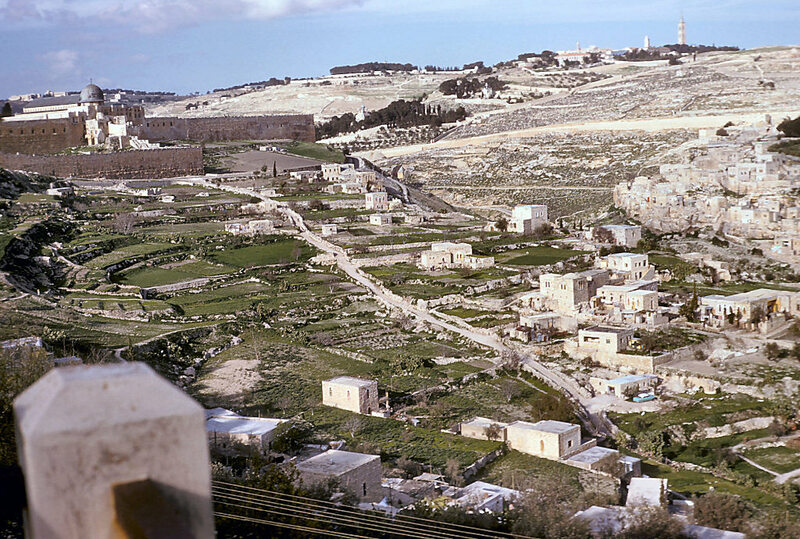 From an airplane, you can better see some features of the topography, but the houses, often three- and four-story, obscure the land . . . . One of the most stirring moments for me as I went chronologically through Dr. Feinberg's slides was his 1968 visit to the Western Wall. Though I never met Dr. Feinberg, I felt as if I was right there with him on this occasion. Each year when he visited the Western Wall, he took many pictures. 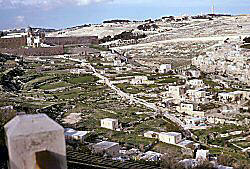 But in 1968, following Israel's possession of the Old City, the area was completely different. The ramshackle neighborhood adjacent to the Western Wall had been cleared to make room for a large prayer plaza. Jewish people were now praying at the wall. If such is possible, I felt that I was experiencing Dr. Feinberg's excitement as he took picture after picture -- standing in one place and just slowly turning and clicking. He must have taken a roll of film as the thrill of the moment overwhelmed him . . . .
"There are older illustrations of the Holy Lands and there are older photographs than Dr. Feinberg's. But there are few that are older that are in color . . . . What the photographs of Dr. Feinberg lack in age, they make up for in color and authenticity . . . . One last reflection. These are the photographs that Dr. Feinberg showed his classes, time and again. He would often use them when he preached on Israel in prophecy. He had to manually sort through them one by one to arrange that day's particular presentation; would that he had this digital collection to make his work easier! . . . . To experience these photographs is not only to know better the land, it is to know better the man and his Jewish heritage as well as his passion for the Scripture and the Lord. For me, it has been an enriching experience and I trust that it will be for you as well." From the Preface by Dr. John S. Feinberg: "The apostle Paul says that Israel had the great advantage of being given the very oracles of God, the Scriptures (Romans 3:1-2). Dad, like many other orthodox Jews, had a deep and abiding devotion to the Scriptures, for it is part of his heritage. He could hold it in his very hands, read it in the languages in which it was originally written, and guide his life by its precepts. The Holy Land was also part of his heritage, albeit not something that he could hold in his hands. Rather, it had to be visited and seen, and so at an early age, Dad developed a longing to visit the land . . . . 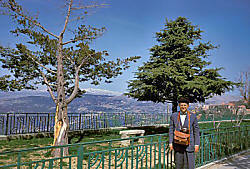 The opportunity for him to visit Israel finally came in the late 1950s . . . . Dad was ecstatic as he eagerly awaited the day of departure. When he returned from that first trip, you could tell that the experience had touched him deeply. Dad had an encyclopedic knowledge of Scripture, but I remember him saying after returning from that first trip to the Holy Land that the things he saw just made Scripture “come alive” for him. Without the birth of the modern state of Israel, who knows whether Dad ever would have had a chance to see this land he loved so much? But the hand of God in twentieth century history opened the door, and Dad just couldn’t resist seeing this “new thing” that God was doing with his ancient people Israel . . . .
"Merely going to Israel, however, wasn’t enough for Dad. How could he possibly communicate to family and friends the wonderful things he had seen and done? Sharing memories was a good start, but memories fade after awhile. Pictures could fill in the gaps that mere words cannot convey, and so Dad took copious amounts of pictures. In the Lord’s good providence, he returned many times to the Holy Land, usually leading a tour, and he never tired of taking pictures each time he went. Though I never accompanied him on one of these trips, I felt a certain familiarity with the land because of Dad’s pictures. Dad frequently filled the pulpit as guest speaker at various churches. In many a Sunday evening service, Dad shared his experiences in the Holy Land, illustrated, of course, by pictures he had taken. I had the “duty” and pleasure of running the slide projector for him on many of those Sunday evenings. 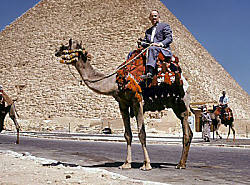 Dad had a wealth of pictures, but he had lovingly selected a sampling of the “highlights” of trips to the Holy Land. And there were special stories that went with every slide. Though I heard those stories many times, I never grew tired of them or the pictures. After the service, people who had been there were often ready to sign up for his next tour; they felt that they had really been given a full taste of the Holy Land. Dad’s knowledge of the Bible and his increasing knowledge of the land with every new trip made his presentations irresistible. "A number of years ago, my family and I were preparing for a first missionary trip to Europe. Before we left I talked with Dad about the upcoming trip. Dad said, “Get yourself a good camera, and be sure to take a lot of pictures. Those are your memories.” Indeed, he was right; as time passes and memories fade, pictures help immensely to recover those memories. 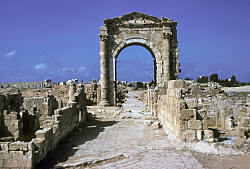 Thanks to the marvels of modern technology, we are pleased to share with you Dad’s memories of the Holy Land. My brother Paul (deceased), my sister Lois, and I have had the privilege of previewing what you will see on this disc. Our reaction is most positive and we are confident that you will greatly enjoy what you see! We trust that Dad’s memories of the Holy Land, captured so magnificently on this disc, will help to illumine your understanding of God’s Word, and that as you view this visual confirmation of so many biblical places and events, your walk with the Lord will grow deeper and your faith will grow stronger!"